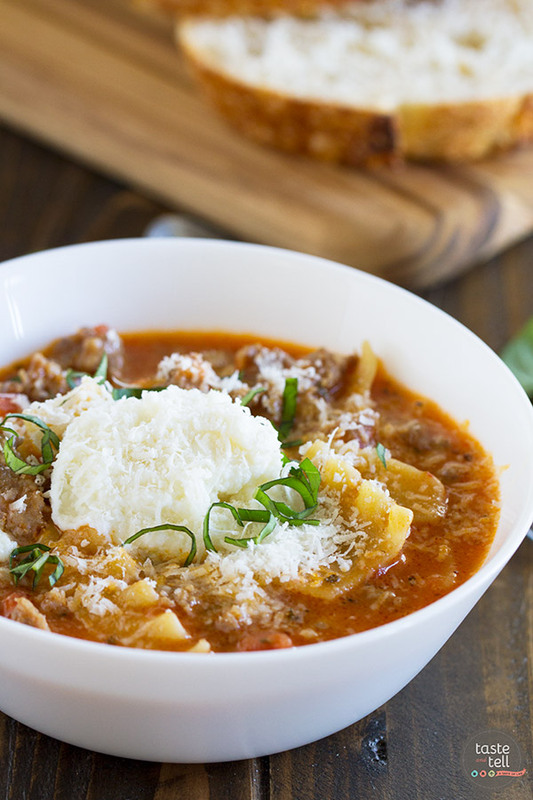 All of the flavors of lasagna in this easy, comforting Lasagna Soup Recipe! 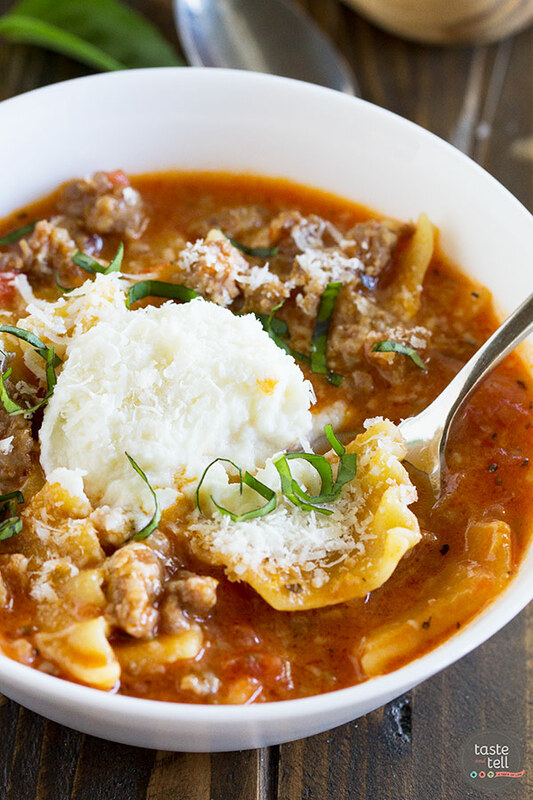 This soup is the perfect way to warm up with a taste of Italy. Things definitely look better this week, but even with our regular schedules, it takes some planning. And some quick cooking. 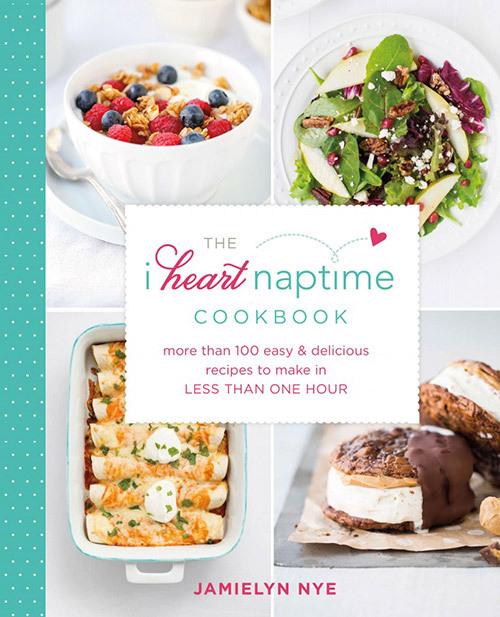 Enter today’s cookbook review – The I Heart Naptime Cookbook. 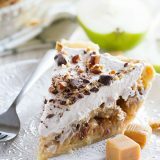 Written by blogger Jamielyn Nye from I Heart Naptime, this cookbook contains over 100 recipes that you can make in under 1 hour. Yes, please!! This book is filled with all kinds of great recipes. 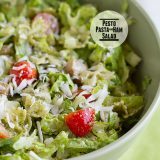 Of course, I will be using the dinner recipes often, but there are also breakfasts, side dishes, party recipes, soups, salads, desserts and so much more. And as a bonus, she even includes some fun things like templates for spice jar labels, cupcake tags, and how make sundae kits. This really is such a fun book! Number of Photos: lots! The photos are plentiful and beautiful throughout the book. Difficulty of Recipes: easy. 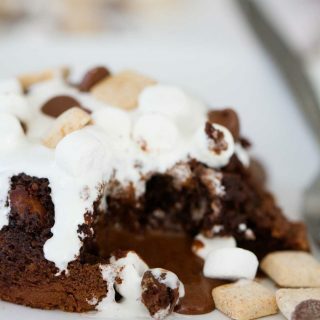 Since you are able to make all of the recipes in under an our, they are meant to be easy! Availability of Ingredients: easy. I didn’t see any hard to find ingredients – they were all common, family friendly ingredients. Buy The I Heart Naptime Cookbook on Amazon. 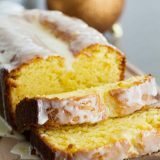 I had a lot of recipes bookmarked. It was easy to find a lot of things that I wanted to make. 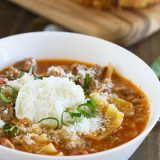 For some reason, though, I kept coming back to this Lasagna Soup Recipe. I almost changed my mind more than once, simply because I already had a lasagna-themed recipe on the menu for that week. But every time, I just kept coming back to this soup. I guess we must just really like lasagna flavored recipes!! So I decided to just go with it, knowing that we would love it. I’ve mentioned this before, but my daughter loves soup. If you ever ask her what is her favorite thing that I make, the answer will always be soup. And now that it’s starting to cool down outside, I can see lots of soup in our future. 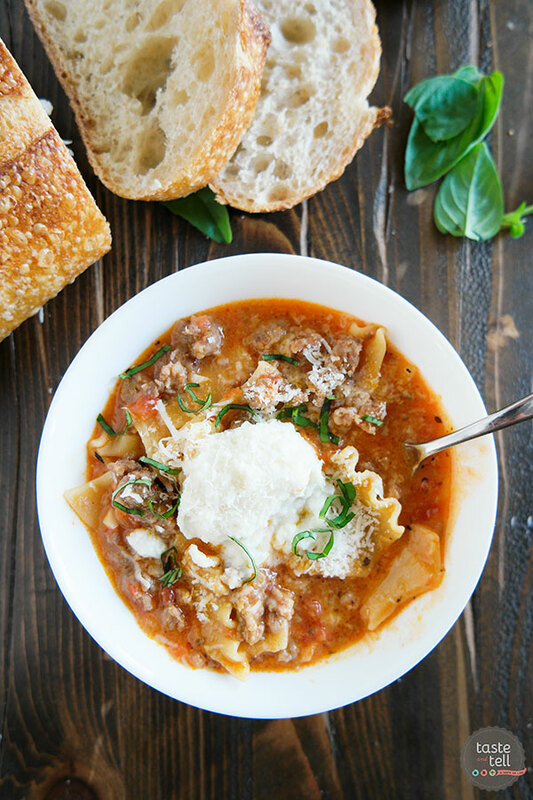 This Lasagna Soup Recipe was everything that I was hoping it would be. 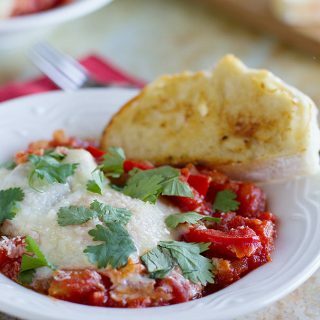 You really do get all of the flavors of lasagna in a bowl. 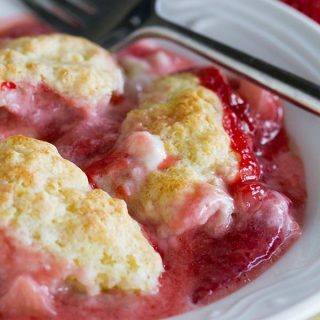 The recipe says that the ricotta on top is optional, but I would not recommend skipping it. 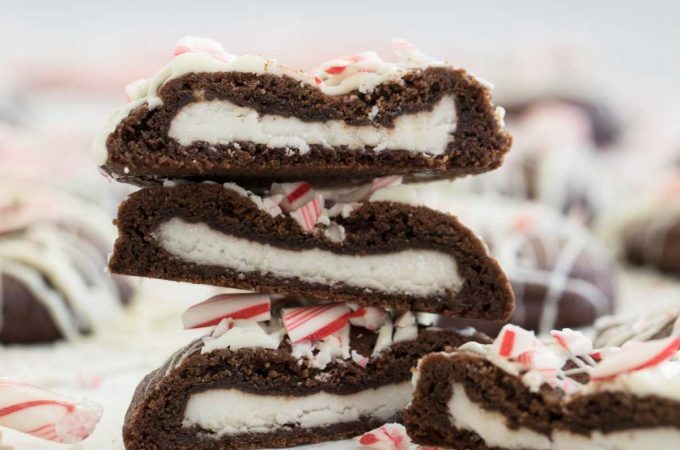 It was the perfect ending touch for this recipe. This is a thicker soup, and the longer it sits, the less liquid you have because the noodles soak it all up. In fact, if you have leftovers the next day, don’t plan on it even looking like soup. But you can always thin it out some more with some extra chicken stock. 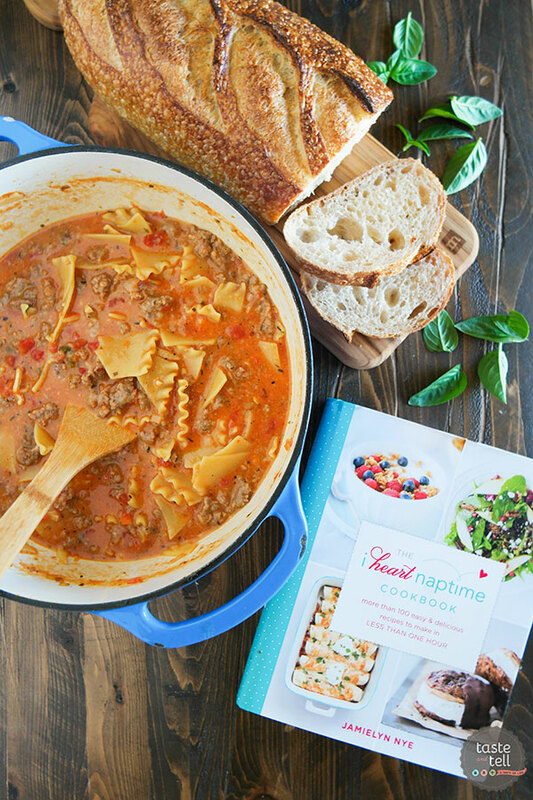 As the temps get lower and lower, I can see this Lasagna Soup Recipe (as well as many other recipes from this book) on my table! In a large pot, heat the olive oil over medium heat. Add the onion and cook for 3 minutes. Stir in the garlic and cook for 1 minute. Add the sausage and cook, breaking it up with a wooden spoon as it browns, for about 10 minutes. Pour off any extra grease from the pan and slowly stir in the chicken stock. Add the tomatoes with their juice, the tomato paste, oregano, thyme, and basil. Bring to a boil over medium high heat. Add the lasagna noodles and cook until the noodles are tender, 8 to 10 minutes. Reduce the heat to low, then stir in the mozzarella and Parmesan. Season with salt and pepper. Ladle the soup into bowls and top with Parmesan, fresh basil, and ricotta, if desired. *I didn’t have enough tomato paste on hand, so I only used about 2 tablespoons. It worked! This is a thick soup, and will get thicker as it sits and the pasta soaks up more of the liquid. If you want to thin it out, you can add more chicken stock. How do you think this soup would work if you prepared the noodles separately and then stored in separate containers for leftovers? The texture of leftover noodles in soup…just, no. I do my chicken noodle soup separately, and love the results, but wasn’t sure if the lasagna soup required some of the pasta starch??? This soup looks fantastic and it will be on the menu plan next week. 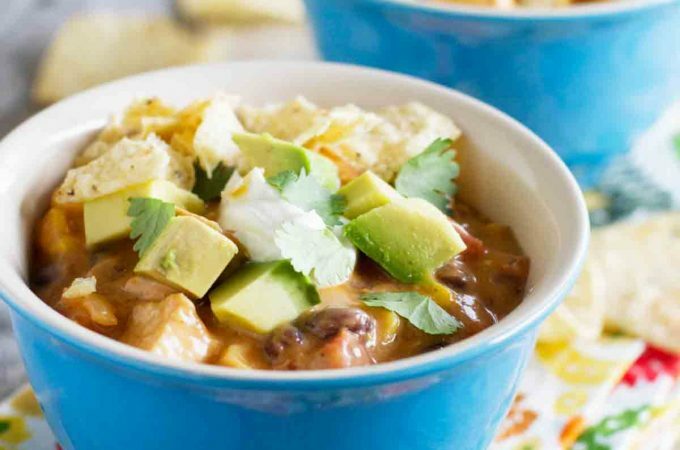 This looks and sounds lovely, and a definite must make since the weather finally has cooled down to a point where one would enjoy soup (or anything) hot. I have pinned and will make very soon! Delicious! 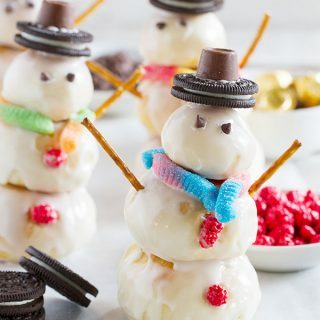 Will definitely make again and share.